Brown butter is a baker’s best friend. If I had a pound for every recipe I’d read extolling the virtues of this simple ingredient since I’ve been blogging, I’d be a very rich little loaf. Until fairly recently I’d always thought of it as a savoury thing, the foaming beurre noisette surrounding a piece of white fish or flavoured with sage and poured over pasta; I’m only just starting to understand the joy of stirring it into biscuits, cakes, cookies and muffins to ramp up the flavour and add to their intensity. Brown butter, or beurre noisette (‘hazelnut butter’) gets its name from the rich toasty smell and nutty brown colour which result when you continue to cook butter beyond its melting point. As the butter heats, the milk solids separate out from the butterfat, sinking to the bottom of your pan and slowly turning a gorgeous golden brown. It’s very easy to burn, so requires careful attention to avoid getting bitter, blackened lumps, but provided you pay attention to your pan, brown butter is a simple, delicious addition to almost any recipe. In this instance, I’ve added it to cookies. Having read about brown butter cookies in the most recent issue of Made with Butter magazine, I encountered them again in Joy the Baker’s book, then again on this gorgeous blog, as well as on a number of other sites, until it got to the point where I’d spent more time reading about them than it would have taken to rustle up a batch. The time had come to bite the bullet and find out what all the fuss was about. When it comes to chocolate chip cookies, everyone has an opinion. A lot of people swear by a single favourite recipe as well, but I’m slightly to fickle for any such rule to apply. I like my cookies large, allowing for a crispy edge leading through a chewy mid section to a soft melting middle; I like chunks rather than chips for added texture and a big chocolate hit; I like lots of brown sugar to increase the chewiness and caramel flavour, but after that I’m open to suggestion. Milk or dark chocolate? I’m happy with either. Brown or white flour? Each works in its own different way. Nuts or not? I’ve tried pecans and walnuts, macadamias and brazil nuts with equally delicious results, as well as leaving the cookies completely nut free. Or you could use brown butter to add an extra element of nuttiness without any crunch. This dough use two lots of butter, one sizzled in a pan until rich, brown and nutty, the other creamed with sugar until light and fluffy. The former is to the latter what caramel is to sugar: a deeper, darker, altogether more adult ingredient, rich in its intensity and packed with flavour. Combined with three types of sugar, large chunks of the best quality milk chocolate and buckwheat flour for an extra hit of nuttiness (and gluten free! ), it makes for a pretty serious cookie. If you do one thing today, make brown butter. If you can push it to two, make brown butter and stir it into cookies. Eat some dough (I defy you not to), eat a cookie hot from the oven, then try another later when they’ve cooled to a chewy, chunky, dense nutty slab of chocolaty goodness. Eat another one the next day for breakfast, sneak one into your packed lunch at work, sandwich them around ice cream after dinner and savour each and every last mouthful over the next few days until the whole tin is gone. Then repeat. This is the start of your journey into the world of brown butter. It’s going to be good. Just one cookie is never enough . . .
First of all, make your brown butter. Melt 85g of butter in a saucepan over a medium heat. Continue cooking, swirling the pan constantly, until the butter starts to foam and crackle and the milk solids separate out begin to brown. Once the butter is golden with a nutty aroma, remove the pan from the heat and allow to cool slightly. Be careful not to overcook it as you don’t want black butter! In a small bowl, whisk together the flour, baking soda and salt. In a separate bowl or stand mixer fitted with the paddle attachment, cream the remaining 100g butter with all three sugars. Add the egg, egg yolk and cooled brown butter and continue to whisk until just combined and smooth, about 30 seconds. Using a wooden spoon, stir in the flour mixture until smooth. Add the chocolate chunks and stir until combined. Cover the dough with cling film, pop in the fridge and chill for 24 hours. Preheat the oven to 180 degrees C. Line two trays with non stick baking parchment. Bake for 5 minutes then remove from the oven. Your cookies will have spread significantly, so coax them back into a perfect round shape with a teaspoon, then return to the oven for 3-4 minutes more. Regardless of method, err on the side of caution – these cookies are best removed from the oven when they look slightly underdone as they will continue to cook once you remove them. Allow to cool slightly then enjoy. Preferably with ice cream or a tall glass of ice cold milk. Oh, yes, like this idea very much. I love brown sugar for cookies for the flavour it adds, don’t know why hadn’t thought of brown butter to add more flavour. Cunning! These look like the IDEAL chocolate chip cookie! Totally with you on the chunks vs. chips issue…I’ve never tried brown butter in baked goods, I’m curious as to how much it would actually change the flavour. May give it a go sometime. Great over pumpkin ravioli though! They look like the perfect chocolate chip cookies, I am going to have to try brown butter at some point. Off to satisfying a chocolate craving now. Ooh lovely. I am still looking for the perfect cookie recipe. If I haven’t got Buckwheat flour in, what should I use instead? Well there’s synchronicity, I was just thinking this morning I’d like to try baking some friands with brown butter and see how they turned out. Your cookies sound delicious and I really like your use of buckwheat flour. I usually add a bit in to my normal wholemeal / white wheat mix, but haven’t used it on it’s own very often. 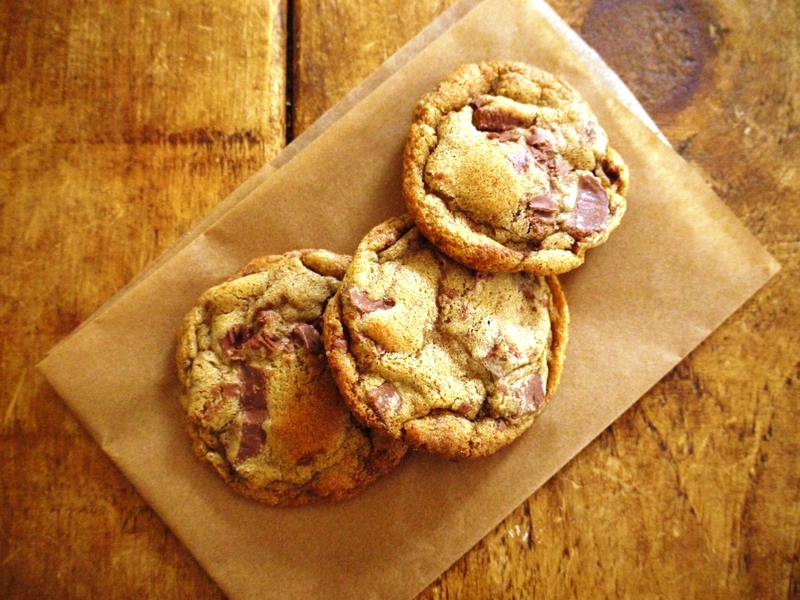 Nor do I have a choc chip cookie recipe I’ve fallen in love with yet, so yours might just be it. Elly – you definitely can taste the brown butter in these, and I’ve made a brown butter sponge before with a really pronounced flavour as well. And agree, it’s just as delicious on savoury dishes! Laura – do give them a try! Things We Make – absolutely fine to substitute normal plain white flour. I’ve found that once you start making baked goods with brown butter, it’s very hard to go back to regular old butter! i know! I’ve been seeing brown butter everywhere in your loaf! Sadly, they don’t sell any here. Would really want to make brown butter pancakes! 😦 These cookies, look chewy and chunky! just the way cookies should be. Oh my! I need to make myself some of this brown butter – I’ve never used it. These look absolutely incredible, Loaf. 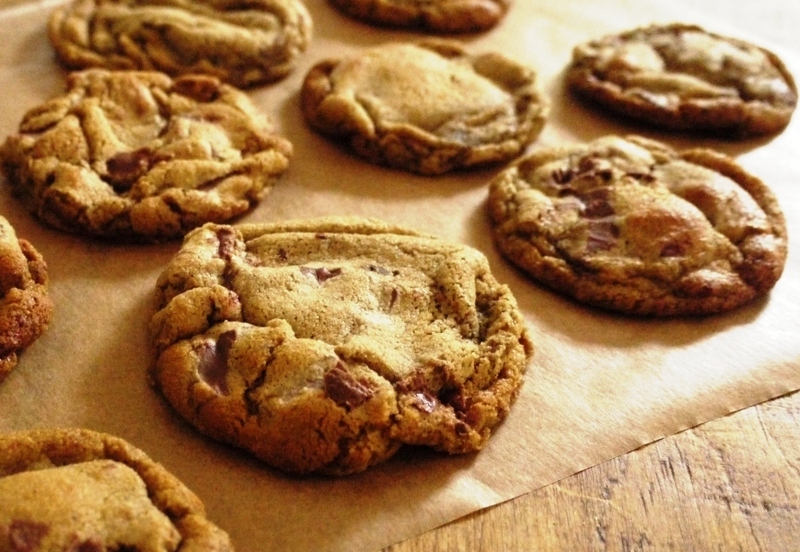 so much so that I want to make double chocolate chip cookies tomorrow… Just you wait. :D.
Kathryn – I know what you mean! Frugal Feeding – definitely one to try – in sweet dishes or on savoury ones. Mmmm these look beautiful and the colour is perfectly golden! Anything with buckwheat catches my attention – why have I never considered it for cookies? Brilliant. Thank you. Oh wow, those cookies look absolutely perfect (or should I say perfect for me? ): chewy soft inside and chewy crunchy edges. Love love love the idea of brown butter and pairing it with milk chocolate. Your cookies always look so good!! These look amazing, I may be tempted to try cooking with brown butter once again (maybe I burned it last time … ?). I am, in fact, always on the search for the perfect chocolate chip cookie and I’ve never considered one with buckwheat before! Tough job but someone’s got to do it! Love it! I have not tried brown butter before but it sounds good and I musty try this. I also like the fact you told us how to make them GF! These cookies look perfect, and I’m pretty sure the buckwheat flour makes them healthy… right? I love that you always share information about your ingredients in each post, so informative! These sound SO incredible. I just made some chocolate chip cookies which I thought were a great healthy sustaining treat.. but I was quick to confirm they don’t totally qualify as dessert. These look like a perfect way to bridge that gap! Love love love! Wow, those cookies look deadly! Marissa – it works really well in these, glad you like the recipe! Amy – aw, thank you. Leanne – the secret is watching it like a hawk! It burns pretty easily so take off the heat if you’re worried you might overcook it. Cake Boule – you should! I think this is the first time I’ve ever heard of buckwheat flou, and only buckwheat fllour, at that, in a chocolate chip cookie. They look reallllly good..I’m extremely intrigued. Creative as always, and great post, as always! 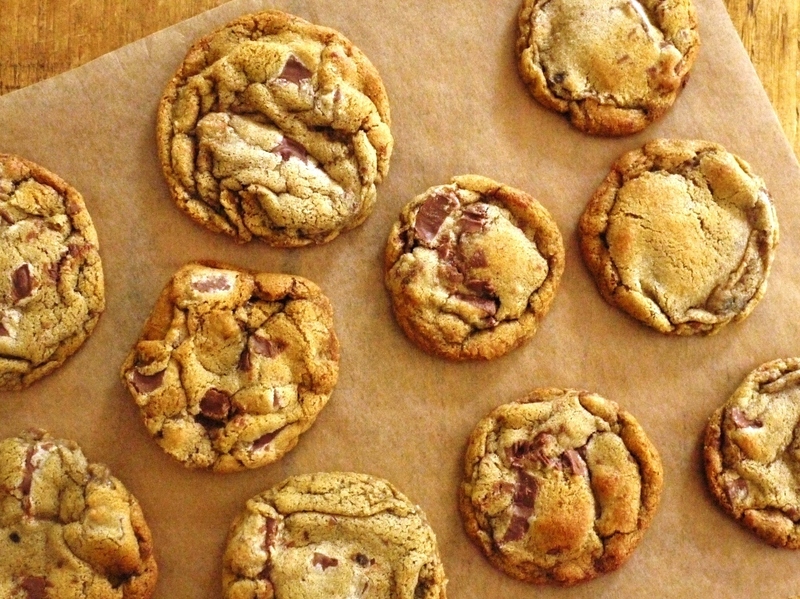 Wow these cookies look just the right amount of crunchy but still soft and chewy – perfection! These are the kind of cookies that make people fall in love with you. Browned butter is the secret in doing so. yum. I get the impression you think brown butter’s a good thing… I’m going to try it in the biscuits I am going to make tomorrow. Your cookies look great, and lovely photos as always! 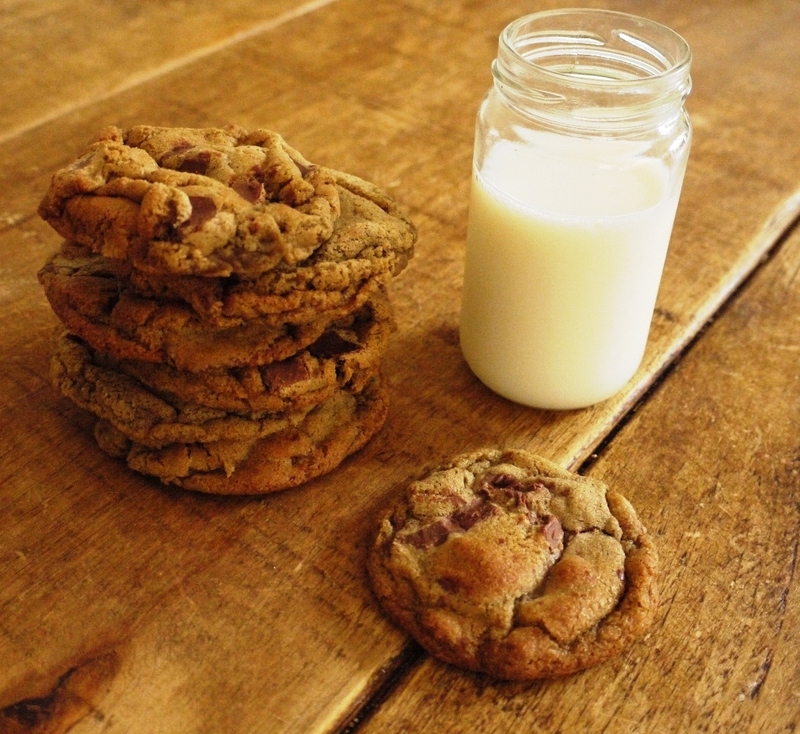 You had me at ‘brown butter’…then ‘rich, sticky cookies’ sealed the deal! umm, these fit the bill for my own ‘stop-merely-planning-brown-butter-cookies’ kick up the posterior; the buckwheat flour shall be a definite feature – hoping it’ll enhance the nuttiness just enough, as I don’t like to put nuts themselves where chocolate can sit. However, maybe I’m being really dense just now but at what point does said brown butter actually get added to the cookies? Sure its role can’t be to look pretty in the pan…can it? So glad I’ve pb cookies ready to bake in my freezer right now! 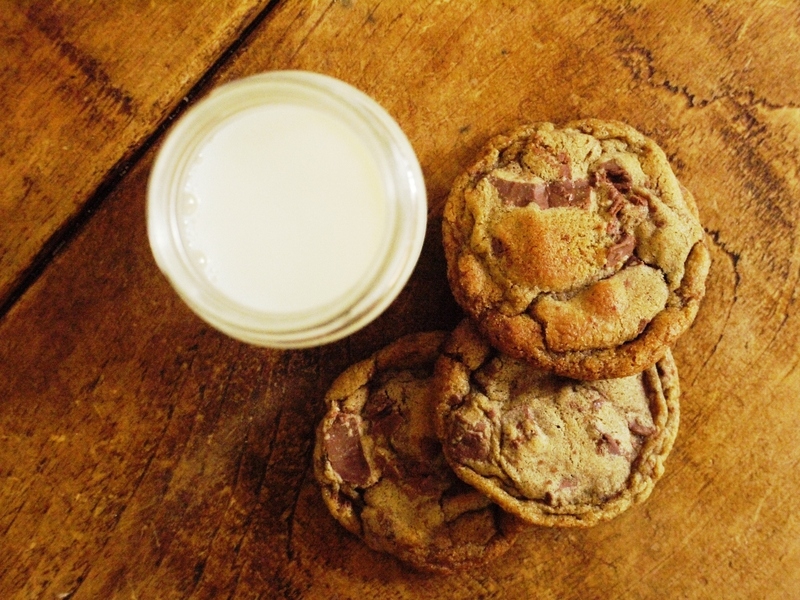 Jennifer – you definitely need to try brown butter in cookies, it’s soo good! Lisa – thank you. Buckwheat is a lovely flour to work with – lovely and nutty and also gluten free! Claire – you add the brown butter (once cooled) along with the egg and egg yolk. Hopefully all clear in the recipe above? Weirdly, it’s not on yesterday’s print-out. Brown butter buckwheat, here I come! Just as a note – presumably unsalted butter here, as it browns with less tendency to burn black! oh wow these look beyond delicious! I’ve never tried brown butter, I am going to add it to my list of things to try! These cookies look perfect though and so delicious that you have just put me in the mood for a choc chip cookie! I’d never thought to use it for cookies, I’e seen some other sweet things with brown butter but not cookies! Wow, I can imagine they are divine! Brown butter and chocolate? Be still my beating heart!!! omg these look AMAZING!! I’ve tried brown butter in cakes and loaves but never in cookies. Chocolate chip cookies are one my favourites. I love that you can make these gluten free as well – definitely making these! Mood Your Food – thank you! Lottie – do give it a go! Baking Addct – thank you, and enjoy! These look *incredible*. I usually make America’s Test Kitchen brown-butter version, but I love the addition of buckwheat flour! These are on my must-make list. I just made these cookies. Instead of just admiring the yummy pictures I tried the reccipe. Well, I made two batches. One with the extra ingredient of instant espresso – the barista in me needs coffee (in everything). I was intrigued by the browned butter – usually to me that means fish and potatoes – but it was delicious! These cookies are great and I will make them again. Sarah – thank you. And enjoy if you end up making them! Pia – so pleased you made and enjoyed them, with your own special twist! Nic – thank you, do try buckwheat, it’s lovely and nutty. Hi Euan – I would think it’s absolutely fine to leave out the brown flecks. You will lose a fair bit of flavour, but the rest of the butter should still have taken on a lovely nuttiness. those cookies look and sound insanely delicious. I’m new to your blog and it’s such a gem. the recipes you make all look so good. I think they’d be the perfect way to try it out 🙂 Happy baking! Thank you 🙂 I haven’t given an exact quantity as everyone likes their cookies different sizes, but it should make about 16 fairly large cookies. As for calorie content, I don’t want to know! Thank you for the gorgeous recipe, everyone love ’em. Oddly enough, the next day, my cookies become crumbly, the first day was really good, it was chewy and crispy all at the right places. can you tell why this happened? oh i left the dough in the refrigerator for extra 2 days (too ill to get up and bake them). Here’s another buckwheat cookie recipe to try. Wow… what an awesome post. You have me convinced that I have to give this concept of browned butter in my baking a shot. I too always thought browned butter was a savoury flavour but this recipe sounds amazing! By the way, I love your photo’s too… I can almost smell the biscuits baking from here in Australia! Ah, thank you so much. And yes, you HAVE to try browned butter in baking, it’s so incredibly delicious. These look DELISH! Thanks for posting! These cookies look great! So yummy!